I just stumbled upon your website by accident earlier today (I was actually looking for articles on Coach Lovett) and was so touched that I wanted to write. I went to school with Anthony for many years… I don't even remember when I met him… middle school maybe? We had a lot of classes together, what sticks out in my mind the most is Freshman Honors English. Everyday before class we'd all sit around and chat with each other; I had a habit of sitting on the top of my desk vs. in my actual seat. Anthony's desk was near mine… he would always tease me…would make like he was going to push me off the desk. He'd push me, then grab my legs or something and stop me from falling. He tormented me like that for a few years. I grew up with Anthony. And although we never hung out with the same people, and although sometimes he "tormented" me, I always knew Anthony was a great guy. I may not have totally understood it at the time, but his "tormenting" came from a fun, joking place. When I learned of Anthony's death a few years back, I was shocked. It is really surreal to think that he is gone. Someone so young and vibrant; full of life. I just wanted to tell you what a great guy I thought Anthony was. He will always be remembered fondly by me, and by so many others. Thank you for starting the program that you have, you are making strides to make a real difference in so many lives. As clearly evidenced, early detection is the only way to prevent such a tragedy from happening to others like Anthony. October 15, 2004. Please view the video presentation as 54,000 K-State football fans saw the video presentation at the home game on the jumbo-tron. On September 4, 2004, a memorial site was dedicated in Manhattan, KS, for the young people connected to Kansas State University Football. On October 16, 2004, a dedication ceremony was held prior to the KSU vs OU football game. Members of each family were present on the football field. Honors were shown as Coach Bill Snyder lead 54,000 fans in 30 seconds of silence to honor these families and those Wildcat members passed on. 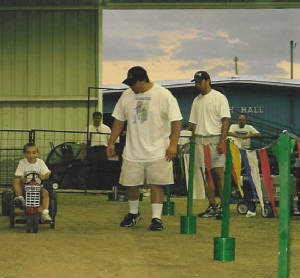 I helped with a kids pedal pull a couple of years ago at the Riley County Fair in Manhattan, Kansas when your son, Anthony, volunteered to help too. I don't know if you have ever encountered Marie Dellen, but she is the greatest community leader I can imagine. She is the one who recruited Anthony and a few other KSU athletes to help. I was the emcee and his job was to encourage these young kids as they took part. He did a better job than did I. He was great at giving them a boost and confidence as they (4 to 12 year olds) used their leg strength to pedal the little tractor that is hooked to a weighted sled. Obviously he was a celebrity through our purple-colored eyes. Although he could have received and focused the attention on himself, his humility and positive encouragement was on helping the kids. Anyway I admired what Anthony did that July evening in our little community for kids he didn't know. In the total scheme of things it was a small moment in time, but he showed class and character when he didn't really have to, but he did. I am not a talented writer, but thought I would try to tell you how cool Anthony was. I know this is no surprise for you, because he was just being genuine - who he was. When I have read of the great commitment you have given to heart screening for young folks I felt an admiration of you as well, and just wanted to tell you "thanks" for making this planet a better place to live. My name is Susan Shipman and the young man in the Riley County 4-H Fair Pedal Pull photo on your website is my son Reid Shipman. When I heard the news of your sons passing, I hurried to have those pictures developed. I took them to Joan at the Football Office and asked if she could get those to you. I knew that if something had happened to my son, I would have loved to have known what he was doing right before it happened. I knew Joan would get you the pictures and seeing them up on the website brought me great joy. I hope you can tell your son was having a wonderful time that night. As each child got off the tractor...he would high five them and tell them what a great job they did. Kids in this town adore K-State football players and your son was no different. Having a K-State football player tell them they had done a great job was like $100 in a candy store. I only wish now that I had had a video camera so that I could have shared that with you. My contact with your son was minimal but he made a great big impact on my son. The way your son conducted himself on and off the field is an inspiration for all of us out there raising boys. We could all learn a lesson or two from you. Thank you for developing the Anthony Bates Foundation. It's a real tribute to his legacy.